There are many modules to include Google Analytics into your Angular 2 project. But actually this overhead is not really required since a plain implementation is only a few lines of code. So you can spare extra modules. I highly recommend you to use Google Tag Manager in order to place the tracking information on your site since it allows you to have a professional workflow. Beyond that you can enjoy the advantages of having a versioned history of your changes. 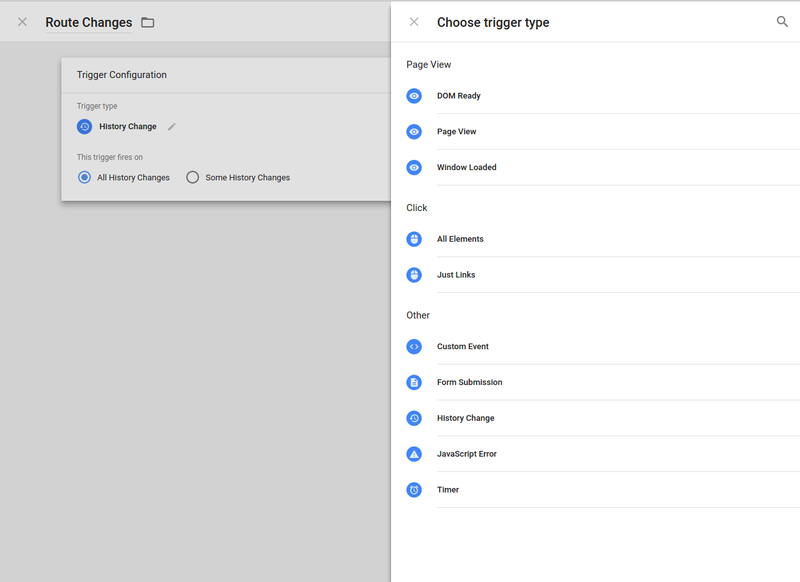 Additional many things are way more easier with Google Tag Manager, for example to implement a simple cookie opt-out that affects all implemented tracking codes. If you don’t want to use Google Tag Manger see the code at the end of this article. Recently we had to implement Analytics on our new site for our German TypeScript User Group ( https://www.typescriptusers.de ). 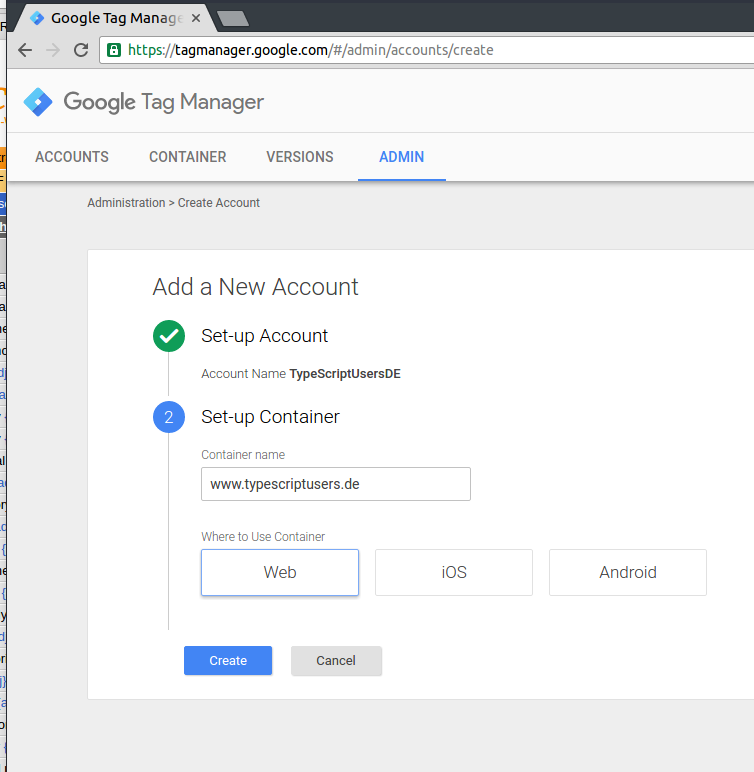 The first step is to create Account and a Container on Google Tag Manager ( tagmanager.google.com ). Once you have added the code to your site it is time for the first publish of your empty container. Until you publish your Tag Manager snippet will only cause an loading error. Use the publish Button on the upper right corner of GTM. Alright. Let’s set up Google Analytics. The first thing to do is to create a property in GA and copy the UA-ID. In GTM Tracking codes are implemented as Tags. So when you want to add Facebook’s Tracking Pixel you’d simply create a new tag for it and bind it to a Trigger (pageview, click, form submission,..) to fire on. Lets create our first tag for Analytics, fill the form as seen in the screenshot below. But keep in mind to use your own UA-ID. Leave the “Fire On” empty for now. We need to create a trigger first. GTM will now observe the HTML 5 History API. Any route change will call the trigger. Now it is time to connect the trigger to our Google Analytics Tag. Go to Tags and select the GA tag. Change the “Fire On” -> “More” -> “Route Change”. Then save the tag and publish your changes by using the publish button in the upper red corner. 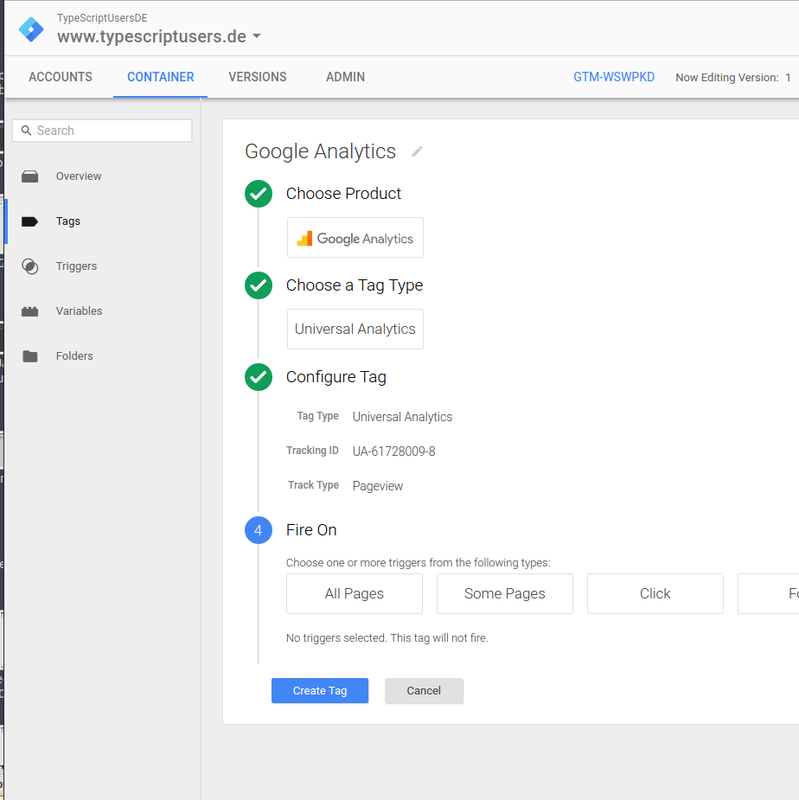 This tutorial applies not only to Google Tag Manager and Google Analytics but to all tracking tools that can be connected to GTM. So you can add Piwik, Facebook, AdWords Tracking, Crazyegg, and many more without even touching your application’s source code once. MAKE SURE TO INSERT YOUR OWN UA-ID! Thanks very much for this! Exactly what I needed. I did have to move the function declaration to before the @Component. And you are right! I’ve updated the code snippet, thanks! 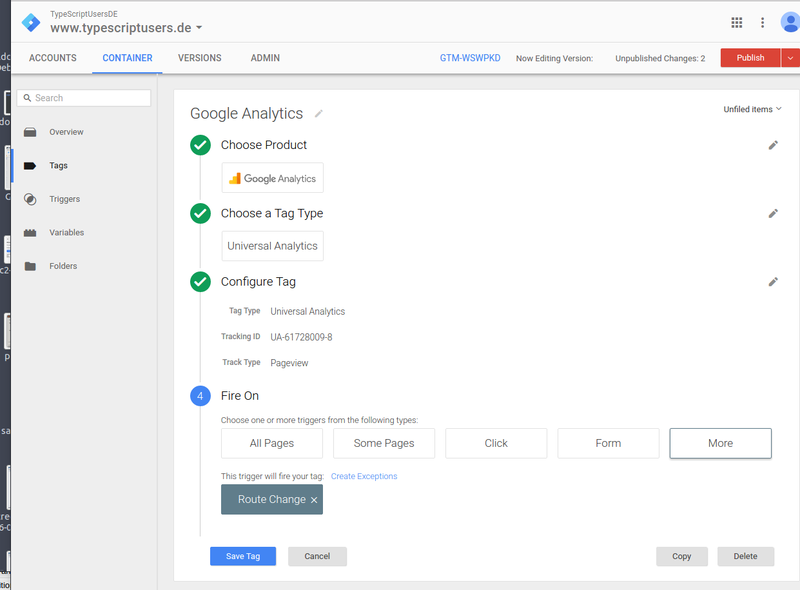 if the dataLayer is not defined the Google Tag Manager Snippet is not yet included. Add the container snippt to your index.html. You can find it at tagmanager.google.com/?hl=en then select a container and finally click on the displayed container ID in the top navbar. This code does not work in AngularJS 2 RC5. You get error TS2304 “Cannot find the name dataLayer”. Even when you add the google tagmanager code in the body, the compiler still does not have the dataLayer variable defined. I have not found the solution yet, but I do know that if you compile your typescript first, then add the code, it works. If updated the code snippet. This should do all required triggering without the need of a custom event, e.g. withough any Angular2 Code change, shouldn’t it? thanks for the hint, I have updated the information above! Tutorial now refers to History API . This is simpler since no code adjustment is required but this approach wont work for AngularJS 1. Hi! This tutorial was very useful. One thing: I’m not sure if I did something wrong or it’s not meant to be logged, but is there any way to log the path that the user is visiting? All my logged visits are to /, it ignores everything after the #! are you using Angular 1 or 2? If you are using Angular 2 i highly recommend to remove the hashbang! It is obsolete and you should use HTML 5 history API with URLs like this ‘http://wwww.domain.com/route/deeproute’. Then GTM will be enabled to catch the URL changes. Plus you are later enabled to redirect the URLs on the serverside. (this can be really important for SEO! !, HASHBANG = no 301 redirect). Thanks for the advice. I followed what you told me and it’s working perfectly now. I wasn’t aware there was a way to get rid of the hashbang. I had looooots of problems when refreshing the page and getting a 404, I’m sure you know what the problem is, but managed to find the right config combination for both my app and the server. when i use this code in my angular 2 app it shows no exported member ‘ ROUTER_DIRECTIVES’ ! you can skip the ROUTER_DIRECTIVES call, it has been deprecated. I’ll update this blog post soon. any ideas on how to add logged in user to the tag manager tracking ?? or do we have to go back to the non tag manager method to get user id in the data ?? Then you have access in GTM via data layer variables. I dont have index.html file in my Angular2 application. Where can I put my tracking code? Do we have tracking code for typeScript? The tracking code you insert to your HTML File is mainly for loading Google Analytics // Tag Manager. If you have no global entrypoint in your application you can load the file for example with your build tool. Downside: you don’t receive updates that are made to the file from Google. It does not send the full path ,, how can i fix this? Hi! We implemented this way for our websites but we have a problem that meaning is caused by Angular2. Google Analytics does not identify the source traffic, mainly Facebook ads(using UTM) and Google Search. Has anyone had a similar problem? This is because the parameters that Facebook attaches to the URL are not transferred to Google Analytics. To do this, you would have to send the parameters to Google Analytics manually. We have migrated our website to Angular2. Initially we struggled with Sessions tracking which got solved by moving “ga(‘send’, ‘pageview’)” to app.ts. Now the issue is we are not able to track Ecommerce on GA i.e., transactions, revenue ,etc. Kindly help to let us know what needs to be done for this. To Send eCommerce data in GA, you can use below code. Hope this will help you. Its working fine for me. ‘revenue’: ‘27.50’, // Grand Total. ‘name’: ‘Garg Rommy’, // Product name. Required. ‘price’: ‘12.30’, // Unit price. ‘name’: ‘Rommy Garg’, // Product name. Required. ‘price’: ‘15.20’, // Unit price. I implemented GA with Google Tag Manager per this blog post and so far so good. I can see pageviews in real-time. I guess the next step though is, how can I add event-based tracking (e.g. clicking a link) if implementing GA using Tag Manager? I tried enabling such triggers directly on Tag Manager and it did not work. Works perfectly except since first pageview has no “History Change” then trigger will never be fired for the first pageview. Is it possible to find any solution to this? Google Tag Manager is not needed in angular 2 + versions . Right? Not sure where the issue is. We are using the GoogleTagManager provider. I see the events show up in the window.dataLayer object. Looking at the gtm.ts code. In the eventTrack method it defaults to ‘iteraction’ if properties.event is not defined. The ‘event’ property is never passed in the properties object, however eventType is. And eventType matches what I defined in Angulartics2On tag. What is the version of angular-gtag compatible with Angular 4?